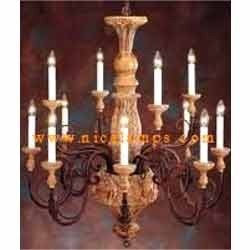 We are manufacturer and supplier of Wooden Chandelier. Wooden Chandelier are often ornate, containing dozens of lamps and complex arrays of glass or crystal prisms to illuminate a room with refracted light. We are looking for queries from foreign countries only. Area of Application: Hotels, Party Palace etc. 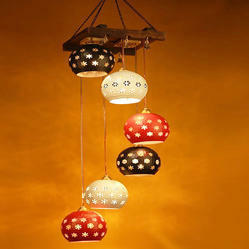 Saifi Interior & Woodcraft India Co. This Wooden Chandelier in a brown and white colour has a contemporary appearance and is perfect to be installed over dining tables and in living rooms. FOS Designs & Services Pvt. Ltd.
A chandelier is a branched decorative ceiling-mounted light fixture with two or more arms bearing lights. Chandeliers are often ornate, containing dozens of lamps and complex arrays of glass or crystal prisms to illuminate a room with refracted light.We are mainly looking for queries from East India Regions. Price Range: Rs 400-20000 Per Piece.